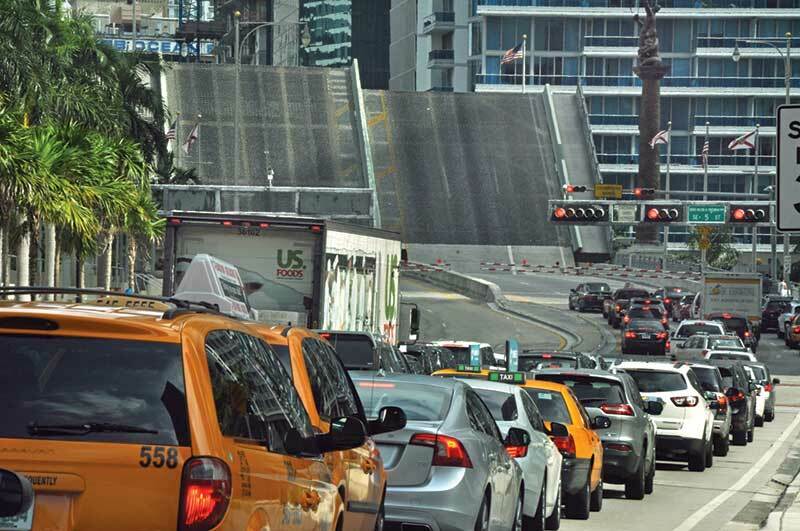 After years of wrangling, a temporary compromise seems near on lockdowns of the Brickell Avenue Bridge over the Miami River. Miami’s Downtown Development Authority has been at loggerheads with the Coast Guard about what the authority calls improper openings to let pleasure craft through. Current hours of no bridge openings (at least in theory) are 7:35 to 8:59 a.m., 12:05 to 12:59 p.m., and 4:35 to 5:59 p.m. weekdays, except for vessels in distress or under tow (usually freighters.) All other times, the bridge is to open only on the hour and half-hour if a vessel requests it. Authority chair and Miami Commissioner Ken Russell held a mediation session among authority members, the state transportation department, the Miami River Commission, the federal marine agency and other stakeholders, he told authority members Friday. A potential compromise was reached: in a pilot program, the bridge will be locked down from 8 to 9 a.m. and from 5 to 7 p.m. weekdays. “It’s a shift and a trade-off,” Mr. Russell said, in that the authority is giving up some morning time to gain more in evenings. “FDOT is on our side. They pushed back with dueling studies” when the Coast Guard said locking down the bridge would affect waterway safety. The plan isn’t working. I’m currently stuck right in front of it, with 20 people right behind me trying to get into 95. It’s 6:52. Unacceptable.